The Pennsylvania Workers’ Compensation Act provides benefits to workers’ who are killed in the course and scope of their employment. These benefits are available whether the death results from an injury or an occupational disease. If a loved one or family member dies in the course and scope of his or her employment you should consult an attorney to determine what if any benefits are payable, and to make certain the insurance carrier pays the right amount to the right person. What Can the Family Receive? When an individual dies a funeral benefit of $3000.00 is paid to the family. Additionally, a weekly or bi-weekly benefit based upon the worker’s wages at the time of his or her death will be paid to surviving family members. Who Will Receive the Benefits? Generally benefits are paid to the surviving spouse and children. In certain circumstances, when there is no spouse or children, benefits may be paid to other family members who are actually dependent upon the deceased worker at the time of his or her death. If there is a surviving spouse he or she would be entitled to a percentage of the deceased worker’s wages at the time of death. That percentage varies depending upon how many children the widow/widower has custody of. These benefits are payable until the widow/widower remarries at which point they are entitled to two more years of benefits. There are other times when these benefits can be contested or interrupted and we recommend you seek legal advice to guide you if you are a recipient of these benefits. If the child is enrolled in an accredited University he or she can receive benefits until graduation or until the age of 23. If the child is disabled he or she can receive benefits for the length of the disability. If the disability is permanent then the benefits are permanent as well. If the deceased worker doesn’t have a spouse or children, or the spouse or children are ineligible, the benefits can go to the parents of the deceased worker if the parents live with, or are dependent on the worker at the time of death. If none of the above family is eligible to receive death benefits for the deceased worker, the siblings of the worker can receive the death benefits if they live with or are dependent on the worker at the time of death. The exact percentage of the worker’s benefits that will be paid out varies depending on the situation of the dependents. If the primary dependent has more people dependent on them (such as a spouse with children), typically a higher percentage of the worker’s wage will be paid based on how many other dependents there are who rely on the primary dependent. The percentage of the workers pre-injury wage that can be received can be anywhere from 20%-66.6% depending on the relationship and number of dependents. If you have any questions about a workers compensation death claim, do not hesitate to call our office. We have two certified workers’ compensation specialists who can answer your questions and help you through what we understand to be a very difficult time in your life. 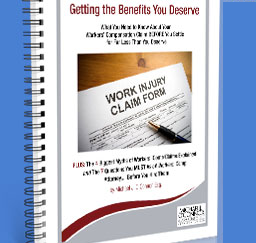 Fill out This Form to Receive Your Free Copy of "Getting The Benefits You Deserve" Our eBook Filled With Workers' Compensation Secrets. Is My Injury Covered Under Workers’ Compensation?